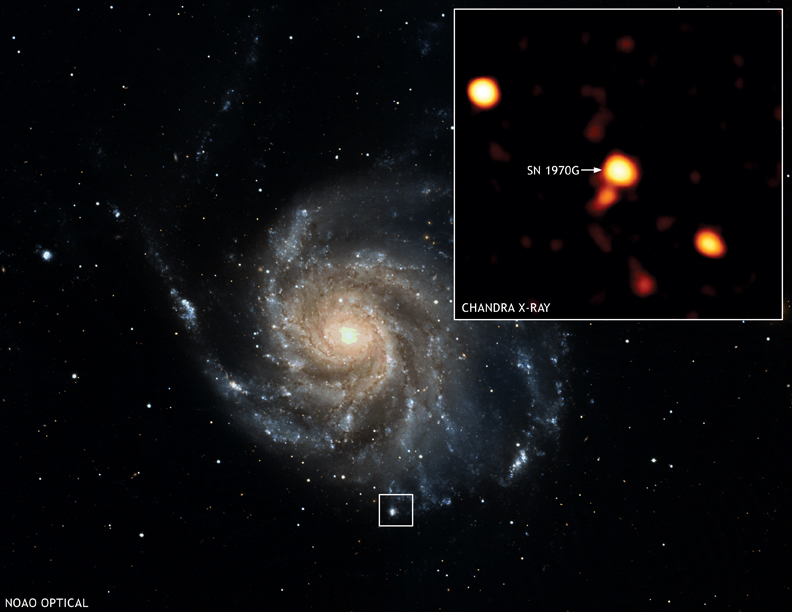 The Chandra image in the inset shows X-rays from SN 1970G, a supernova that was observed to occur in the galaxy M101 35 years ago. The bright cloud in the box in the optical image is not related to the supernova, which is located immediately to the upper right (arrow) of the cloud. Before a massive star explodes as a supernova, it loses gas in a stellar wind that can last tens to hundreds of thousands of years, and creates a circumstellar gas shell around the star. The explosion generates shock waves that rush through this gas and heat it to millions of degrees. 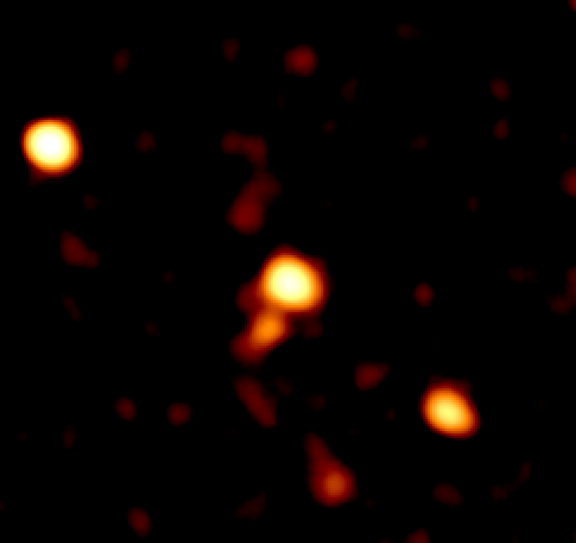 The X-rays from SN 1970G are likely due to this process. By studying the spectrum and intensity of the X-rays from a supernova in the years after the explosion, astronomers can deduce information about the behavior of the star before it exploded. The observations of SN 1970G indicate that the progenitor star created its circumstellar shell by losing about one sun's worth of gas over a period of about 25,000 years before the explosion. Astronomers estimate that in another 20 to 60 years the shock waves will have traversed the shell and encountered the interstellar medium. At this time SN 1970G will make the transition to the supernova remnant phase of its evolution. Coordinates (J2000) RA 14h 03m 00.83s | Dec +54º 14' 32.80"